My first ever piece of traditional knitting wasn’t a gansey. It was ‘Miss Flora Campbell’s cardigan’, a 1930 Fair Isle cardigan, the pattern worked out in the classic (soon to be re-published!) ‘Traditional Knitting’, by Michael Pearson. Pearson’s book came out in 1984, and I must have clocked it within weeks of it landing in our library. A month went past, then another, then a few more and I realised I had this book out on almost permanent loan. And despite it being the 80s, and us being unemployed and broke, and sometimes if we bought books, we didn’t buy food that week… when I saw it in paperback, in Smiths, I swooped. I probably lived on sardines and pitta bread that week. But who cared? I had the Book. This cardigan may be one reason I have had little time for people who whinge about the ‘terrors’ of steeking. Imagine knitting this beauty in the round, your first ever piece of ‘real’ traditional knitting… then taking the scissors to it, to cut a front opening. And yet I did. Years later, I read blogs etc by knitters bigging up The Steek as if it was some towering monster to be fought down, or a rite of passage, worthy of at least 6 stiff gins before you tackle it. Is it hellaslike. It’s just an easier way of making a cardigan. But after the knitting, a couple of things happened that made me rarely wear it, despite loving it. One of those things was – I realised the red in the original, was actually two shades, not just the vivid tomato red I’d used but in the background, in some of the peeries (smaller patterns), it was a pretty crimson. To be honest, it looks like the original knitter didn’t quite have enough scarlet so was eeking it out with some crimson. But that apparent ‘mistake’ just added to its beauty and subtlety. Someone pointed to an old gansey at Ganseyfest, that had an allover pattern, that many people found unaccountably mesmerising. She’d realised it was so compelling because the knitter had made a few mistakes, so your eye travels over the piece, then back again, as you subconsciously try to find what’s going on with the pattern, that should be predictable – but isn’t. Same thing with this cardigan. Somehow that subtle shift between the two reds in the original make overall design, more compelling. At the time I’d bought the wool, I didn’t have my “eye in”, yet. And wasn’t being analytical or critical enough, before I jumped in with both feet. It seemed to me, a straightforward matter of the primary colours, and white and moorit. Yet it was a more subtle, intelligent thing than I first realised. Secondly, I’d got the wrong blue. Mine was darker than the sort of Wedgewood blue in the peeries of the original. The paler blue undeniably works better. The subtler colours of the original just worked better than my slight variations. This was in the days just before the lovely Kaffe Fassett was about to pop up, and give us all some insight into colour theory. Then I washed it, carefully, once, as Elizabeth Zimmerman says, ‘like you’re washing a baby’, and… despite all my lavished care, the blue ran into the white on the peeries. Now it is not so noticeable in photos but for me, that somehow made it less wearable. Last but not least…. the Button Trauma. Now, if you see the buttons on the original, in the book, you’ll see I wasn’t far off. Shape-wise, they were close. But I was broke, it was the 80s, and I thought I could get away with yellow plastic. Now, the vividness of the yellow in the knit fabric was dampened down by the fact it was usually on the same round as the moorit (brown). But those buttons SCREAMED. Don’t get me wrong, on a cold day (or if I was wearing a coat over it), I’d wear it. It saw some use. But not enough. I was also too lazy to change the buttons. I think we all know where this story is going. Well, one place it’s going. First of all, the devil is in the detail. Before you even buy the yarn, if you have the freedom to make colour choices, make considered ones. Secondly… It is all in the finishing. I was happy with this, despite the colours being just marginally off, and the blue from the peeries running into the white on the first wash, right up til I put on the cheap-looking buttons. 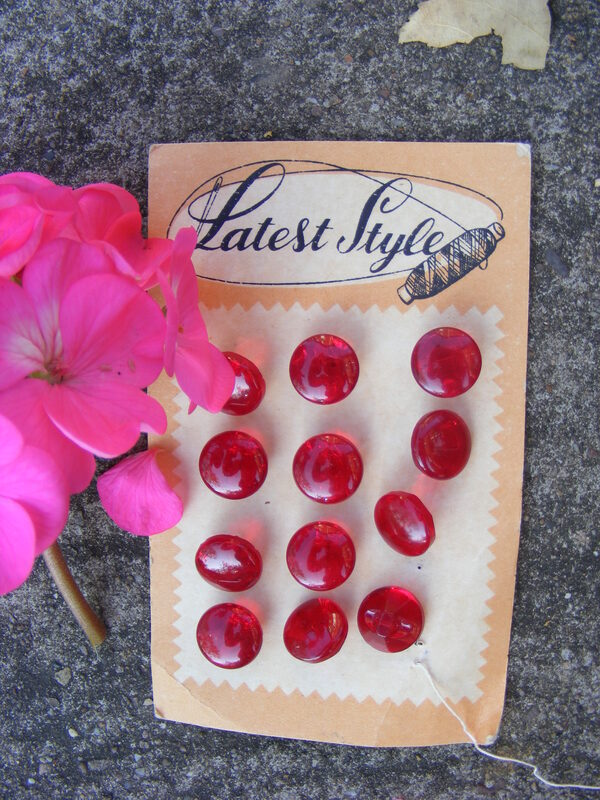 Then in 2010, a trip to my favourite vintage shop, in York, yielded these little beauties. Yes, some sort of man-made material, not the natural bone or horn buttons I’d sort of had in my mind as preferable to the yellow horrors (since 1985), but the minute I saw them, I knew it had to be. Took me another year, almost exactly to bear to detach them from their original packaging. But I did it! These buttons are slightly faceted, and annoyingly, only after I’d stripped all the yellow horrors off, did I realise that I wouldn’t be able to get a wool darning needle (or even, a wool thread), through the holes in them. So I had to sew them on with cotton. I found some matching vintage red cotton, and it was a whole morning’s work to replace every single button on Miss Flora Campbell’s cardigan but…. worth the effort. I can’t take the loose blue dye from the white in the peeries, or change the original wool colours, but I can change ill-advised buttons. And since I did, I’ve been wearing this a lot more! The old ‘Made Do And Mend’ spirit is a bit slow to get going in me (26 years. Is that a record?) But I’m glad I eventually was moved to do something about Miss Flora Campbell. 2012 promises to be a bumper year for the re-issuing of classic traditional knitting books, as I’ve been working on an Introduction to a new edition of Marie Hartley and Joan Ingilby’s ‘The Old Hand-Knitters of the Dales’. Later in the week, it’s up to Grasmere to document one of the oldest extant Dales-style gloves. The book is going to be reissued with some ‘special features’, including designs by some of the foremost contemporary designers, inspired by 19thC Yorkshire knitting, – also, one or two actual stitch by stitch repros of old Dales knitting in Marie Hartley’s collection, and museums elsewhere. It has been fascinating, researching how the 1951 book first got researched and written, and I can’t wait to share it all, with you. If my Ravelry projects page looks dead, that’s because I’ve been busy working on stuff for my own book, ‘River Ganseys’ (working title), and it’s all top secret right now. I’d feel more like 007, if I got special gadgets and stuff. A couple of the book projects include attempts to recreate things Misses Hartley and Ingilby describe fleetingly, as well as several patterns for ganseys, based on our Yorkshire inland ones. But there is now an end in sight to ‘book knitting’, and so I have turned my mind – if not yet my needles – to a bit of Fair Isle, which I’ll start next month, when the book is put to bed, just for a change. 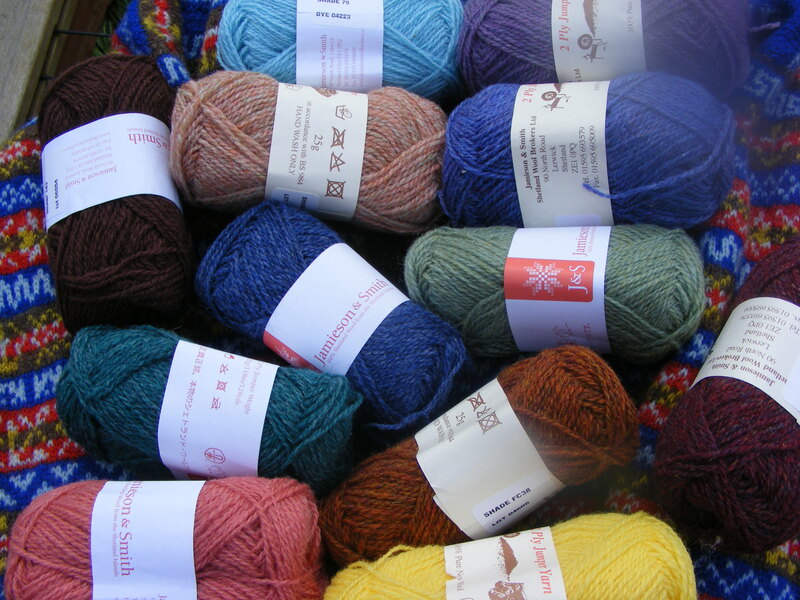 Which is why, this week, I sent for a Lucky Dip of jumper weight Shetland yarn, from Jamieson & Smith, the Shetland Wool Brokers. Worth a punt. I’m hoping to be at the Harrogate Knitting & Stitching Show next month, so will pick up a unifying background colour, if J & S have a stall there, this year. 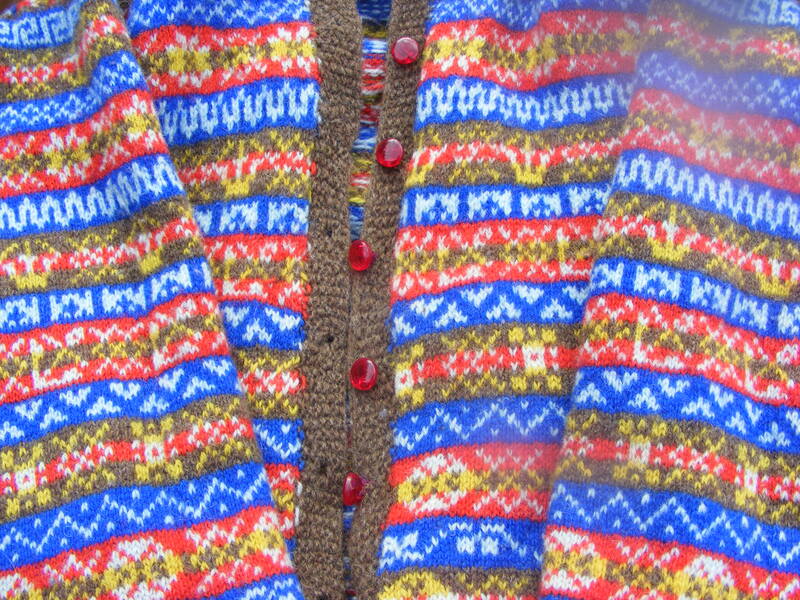 On a genealogical note, as we’re discussing Miss Flora Campbell’s cardigan – our trip to Inverness at the start of the month, made us wonder about our Scottish ancestry. The only possible I have is the surname Calam (sometimes spelled ‘Callam’, even ‘Calomb’) which appears around the 1720s, in my mother’s direct line. This name appears abruptly in the Yorkshire parish records with John Calam, who died in Scrayingham on 11.11.1745. If any of the genealogists reading this have any clues how I can join the dots, I’d be most grateful. It is always hard pre-Dade, if a name just suddenly turns up and isn’t traceable prior to that via the IGI. I have read online that ‘Calam’ is a Scottish name, but it could well be an English one too. I just don’t know..? Any hints or tips gratefully received. Re. 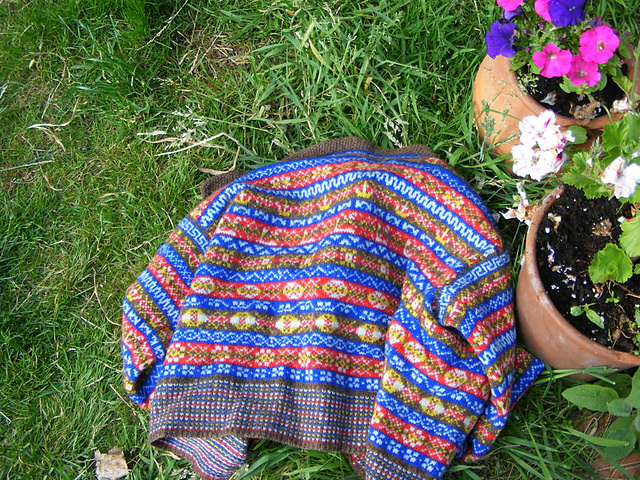 the knitting… These days I have my eye in, and I try hard to channel Kaffe Fassett whenever I go shopping for wool. My next Fair Isle, 26 years on from the first – will be just as much fun to knit as the first one was. Probably. I can answer that one. Genealogy comes to our aid! Some time back, (August 2010), I wrote the piece that follows for ‘Yarn Forward’ magazine. I know they won’t mind me reproducing it here, for those who missed it first time round. But before I do, would just like to say others have written about, and got great photos of, Ganseyfest. So I refer you, dear Reader, to the blogs of the inestimable Liz Lovick, Northernlace, or Gordon Reid’s intriguing Ganseys.com. Ganseyfest? For me, it is impossible to pick out any one speaker, or gansey, or thing. It was all good. Highlights included attending a workshop given by Beth Brown-Reinsel, and the talks given by Anne Coombs on the Herring girls, and Liz Lovick on the forgotten Orkney ganseys. Maybe the greatest honour was meeting Margaret Bennett, folklorist and singer, brought up on the Isle of Skye, who outlined the way knitting and folk traditions interweave. Margaret mentioned the fisher families’ shibboleths, including the belief that a caul was lucky, and that sometimes they were preserved and sold, as it was thought they gave protection against drowning. Now my eyes lit up as my grandad – born in landlocked Leeds – was born with a caul, and his whole life had a fascination with boats and the sea. He bought a boat in the 1960s, and kept it on the Ouse but he’d disappear off to the West coast of Ireland for months at a time, fishing. He’d really wanted a seagoing boat, but settled for one on the river. He almost bought the now famous Bridlington coble, Three Brothers, but backed out at the last minute (I seem to recall my dad said he wasn’t confident he could restore it?) Notice he’s wearing what looks like a handknit jumper there – my grandmother had been dead ten years or so by the time he was in Ireland, so I have no clue who could have knitted that. I have quite a few photos taken onboard Irish fishing vessels and not an Aran or gansey is ever in sight! He’s 70 in that photo. NB: see how he has turned up the welt, in that photo, like a ‘proper’ fisherman? Gansey wearers often mention wanting to turn up the welt when they went to sea, to be like their fathers. Billie (grandad’s) father owned a printing business in central Leeds. He was a foundling, and wheeler-dealer who was such an accomplished conman, he was once approached and asked to run as a Conservative candidate… He lived in a large, imposing house which he rented from my other great grandad, Tom Boothman. Apparently, he took rent paying as ‘optional’.Billie, by way of contrast, was a very hardworking, honourable man who paid off his father’s debts when he died, and worked then ran the Boothmans’ dairy business. Not a fishing gene in sight. My oldest son, William (named after Billie) was also born with a caul, coincidentally. I didn’t keep it. Too grossed out. Margaret’s talk was of particular interest to me, as I have a whole chapter in my forthcoming book, on superstitions or should I say, belief systems and culture and their influence on motifs and patterns. Here on the river, they were a superstitious and sometimes religious lot and that bleeds through into the patterns, sometimes. Just as folklore has leitmotifs, ganseys have motifs that shift and change, refracted through the lenses of different communities. Every talk was great at Ganseyfest, but one that especially caught my interest was the talk given by Dr Malcolm Smith of Durham University, “Gansey Patterns and Cultural Evolution”. Dr Smith is applying academic rigour to the study of motifs, and their migration along the coastline with the herring. During my own research, I had found an account of a Hull lass who became a herring girl, based in Scarborough but often staying up in Scotland in what she called ‘a hut’. Now, for 50 years or more, knitting historians have vaguely mentioned the possible migration of patterns and motifs, but using genealogy we can pin that right down with hard, concrete examples. It turned out, one of the little girls in the famous Harding photo gave me some hard evidence of this process Dr. Smith is studying. This is a shot taken in Harding’s studio. The two girls wear bead necklaces – probably studio props, as many of the children in Harding’s studio portraits wear identical ones. Mary Jane has ear-rings and her pinafore is torn. Another of Harding’s subjects said in old age that he’d ruffle sitters’ hair to make them look more ‘natural’. Knitting sheaths were routinely used by 19thC contract knitters, to get up to speeds like 200 stitches per minute. 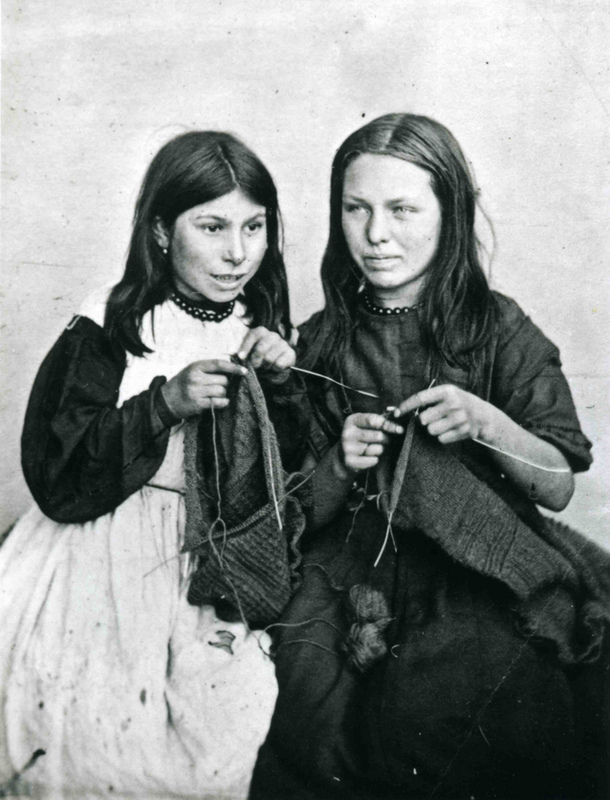 When I magnified the image, I could just make out Ann’s knitting sheath under her right arm – but she is not actively using it – probably because Harding posed the girls with knitting artfully angled towards the camera so we are not looking at an ‘authentic’ image of what 19thC knitting looked like, just two girls holding their knitting. This picture is unique as it is the earliest ‘close up’ probably of a real contract knitter, with a sheath even if it’s barely visible! Posing children would have been difficult, as subjects had to sit absolutely still for 20-30 seconds. The girls use blunt-tipped steel needles that look very crooked and well used. Mary Jane is working the body of a gansey so is working on five needles. Ann is working on a sleeve so down to three needles. Mary Jane’s gansey seems to have a very deep 2X2 rib welt with an allover pattern above. With Ann’s, you can just see the ridge and furrow shoulder, (rows of purl stitches) at the top of the arm which appears to have a narrow pattern near the top (before decreases), between lines of purl. The camera flash shows the glossiness of the 5 ply worsted wound into balls on Ann’s lap. Ganseys were made from lustrous longwool, millspun in Yorkshire, although some people fondly imagine it was handspun* the reality was, ganseys only came about after the Industrial Revolution when millspun was widely available. Wool would be delivered to knitters in 2lb hanks, and they’d wind it into balls before knitting. [‘Cornish Guernseys & Knit-frocks’, Mary Wright, Polperro Press, 1988]. At this date a servant earned 9d a week (4p), so if you could knit at speed you could earn more and stay at home. I was able to find both girls on the 1871 Census. Mary Jane was on Lansallos St, aged 8 and living with her parents Joseph (fisherman) and Ellen. Ellen was born in Grimsby,Yorkshire fishing port – which would have influenced Mary Jane’s knitting and given her different patterns to the Cornish ones, no doubt. Mary Jane had three younger siblings. 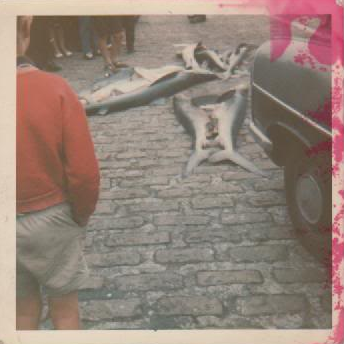 Meanwhile, Ann was also on Lansallos St, with her fisherman father Charles Jolliff, mother, Mary and nine siblings. Both girls are described as ‘Scholar’ (standard term for children in Censuses), yet were competent knitters already by age 10 or so. Looking at the photo, that means we can date the image to the early 1870s: Ann was born around 1863 and Mary Jane, around 1861. By 1881, Mary Jane, age now given 17, has her profession is ‘Frock Knitting’ (‘Frock’ is the old word for jumper). In 1891, Mary Jane’s mother Ellen is described as ‘Knitter’. I used Free BMD, http://www.freebmd.org.uk/ to find Ann’s marriage – in 1875, to fisherman Charles Puckey. In 1891, they live on Lansallos St and Ann’s profession is ‘Knitting Fancy’. Harding didn’t pose the girls with knitting as a prop – both were already contract knitters. Harding was born in Somers Town, London, in 1807 to a wealthy but down-at-heel family. Before he retired to Polperro, he had a colourful life, minsitering to convicts on Norfolk Island for some time, before returning to England and settling in the fishing village of Polperro, Cornwall, living the life of a ‘gentleman’. He took up photography in the 1850s, now middle-aged, using a cutting edge technique. Harding took some of the earliest and finest surviving photos – his subjects being Polperro scenes and people. He is best known for a panel of 80 portraits of Polperro fishermen, from the 1860s. But several of his photos show knitters at work. This is the finest. * I’m talking English ganseys here. Some Scottish ones were handspun.